Electrospraying is a method of generating a very fine liquid aerosol through electrostatic charging. 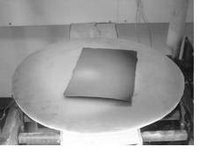 Electrohydrodynamic (EHD) spraying of liquids is a physical process caused by the electric force applied to the surface of liquid. The electrical shear stress elongates the liquid meniscus formed at the outlet of a capillary, to the form of a cone and/or a jet which next deforms and disrupts into droplets because of the electrical and mechanical forces. The droplets generated by the EHD method possess electrical charge, usually a few orders of magnitude greater than the elementary charge, that dramatically changes their EHD properties, like for example electrical mobility of aerosol particles. The electrohydrodynamic spraying extends the droplet sizes available from conventional mechanical atomizers to the lower range. TiO2 particles are used industrially in pigments, catalyst supports, electronic devices, mechanical materials, etc. TiO2 nanoparticles less than 100 nm in diameter, especially, possess interesting optical, dielectric, and photocatalytic properties. Therefore, TiO2 nanoparticles with controlled size, shape, and porosity can be used in thin films, ceramics, composites, and catalysts. To find a feasible alternative solution for simultaneous preparation and application of titania nano-particles using a one step electrospraying process. This novel technique involves in-situ preparation of titania nano-particles thereby removing any agglomeration problem. 1. K/S study showed a reduction up to 60% in the yellowness of the stained samples treated with titania finish on exposing to sunlight for around 10 hours. 2. The self cleaning activity results of the washed samples confirmed the adherence of finish to the cotton which was further proved by stain repellency phenomenon shown by the washed samples.